Given that most non-Americans are unaware that New York is a state as well as a city, imagine how few people know that New York State is producing some really exciting wines. Sue Chambers, founder of Wine Equals Friends, recently visited Hanging Ditch with a selection of her wares, carefully sourced from some of New York State’s finest vineyards. I had previously tried a few wines from the Finger Lakes area and I had enjoyed them, whereas the wines of Long Island were all new to me and I was keen to learn more. Initially sourcing high quality, small production wines to sell to friends, Sue’s business grew rapidly. However, it was a close friendship with a native Long Islander and regular visits there that introduced her to the vinous bounty of the region. Sue’s fortuitous meeting with Susan Spence of the New York Wine And Grape Foundation in 2010 highlighted the qualitative leaps forward that region’s winemakers had taken since her first introduction to their wines a decade earlier, and the idea to specialise in importing them to the UK quickly germinated in her mind. She has recently added a selection of top Finger Lakes wines to her Long Island offerings, forming a comprehensive portfolio of New York State’s brightest and best. From Long Island in the southeast to Lake Erie and Niagara Escarpment in the northwest, New York offers a great diversity of climates, soils, grape varieties and styles of wine. All of the state’s viticultural areas have climates that are moderated by large bodies of water. Because large volumes of water are slow to warm up and to cool down, their temperatures remain relatively constant and they provide a flow of warm air during the harsh winters and cooling breezes over the course of the hot, muggy summers. The Atlantic Ocean and the Long Island Sound protect the vineyards of Long Island and the size of the Finger Lakes iron out the seasonal extremes of temperature in that region. Established in 1982, Finger Lakes is the most diverse of New York’s viticultural areas with over thirty grape varieties planted. There are eleven Finger Lakes, each extending south from region’s “palm” north of Geneva. These long, narrow fingers were gouged out by ancient glaciers that moved south from Hudson Bay, leaving behind limestone and other mineral deposits conducive to growing high acidity grape varieties such as Riesling. 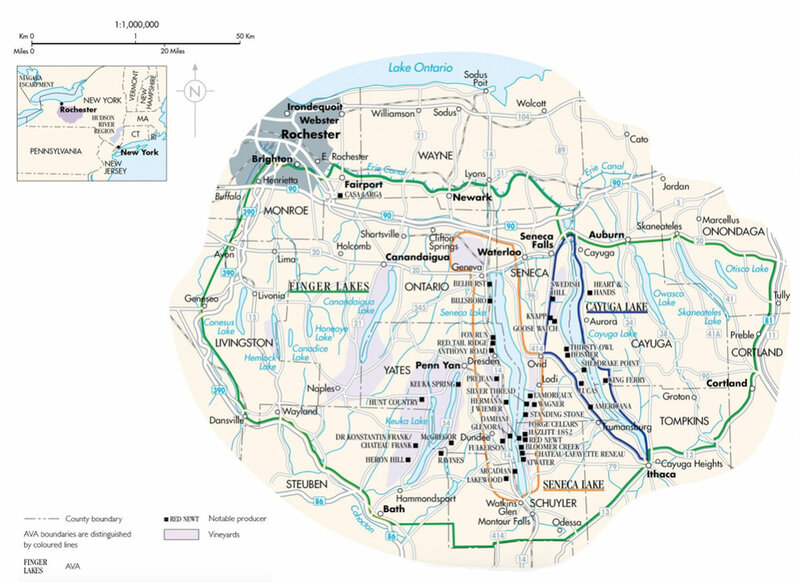 Four of the lakes play key roles in grape growing - Seneca, Cayuga, Keuka and Canandaigua - with vines planted in shale soils on the hillsides that slope down to the waters. The gradients of these slopes and the proximity of the lakes prevent cold air from settling on the vineyards thereby greatly reducing the incidence of frost, but rains during the growing season can be problematic. Riesling rules in the Finger Lakes, although other hardy, cold-resistant white varieties also thrive. Thanks to the cool, damp climate, success with red grape varieties is much more hit and miss. Whilst native Vitis labrusca vines and hybrid grape varieties were the foundation of the area’s wine production, Vitis vinifera varieties, particularly Riesling, are very much the future. Although the Seneca Lake A.V.A. was only created in 2003, Riesling has been grown there since being planted by Hermann J. Wiemer after he arrived from Germany in the 1960s. The first five wines tasted were all from Seneca Lake. Often referred to as New York’s Bordeaux thanks to the quality of Cabernet Franc and Merlot grown there, Long Island extends eastwards from New York City 120 miles into the Atlantic. The general Long Island AVA (American Viticultural Area) contains within it two sub-AVAs: the exclusive Hamptons on the island’s South Fork and the more rural North Fork which historically supplied Manhattan with much of its fresh produce. Most of the vineyards are found on the North Fork, primarily due to the significantly more profitable use of land in the Hamptons for building houses and holiday homes upon. As is also the case with Washington State on America’s west coast, the style of Long Island’s wines falls pleasingly between the fruitiness of those from California and the structure and elegance of those from Europe. The final wines of the evening were produced by two of Long Island’s top estates. Tierce Dry Riesling is a unique collaboration between three of New York State's top winemakers: Peter Bell of Fox Run Vineyards, Johannes Reinhardt of Anthony Road Winery and David Whiting of Red Newt Cellars. All three of these wineries are situated on the shores of Seneca Lake but each has its own distinct terroir. Born in 2004 from a curiosity as to whether or not they could make a better wine together than they could individually, each winemaker makes his own wines before the three of them sit down to determine the best possible blend of their efforts. They’ve been quoted as saying that they look to create an austere style of Riesling, talking about difficult to quantify characteristics such as minerality, electricity and tension. One third (“tierce” in Latin) of the final blend comes from each of the producers. Even by New York State’s standards production is tiny, barely amounting to 300 cases per year, despite which it is regularly regarded as one of North America’s best dry Rieslings. Indeed, the 2010 vintage was served by Senator Charles E. Schumer at the Presidential Inaugural Luncheon in January, 2103. Lime juice and kerosene nose with a hint of honeyed, toasty maturity. Dry, lean and linear, with an elegant richness (12g/l of residual sugar). Fresh, precise, chalky lime fruit, a very slight vegetal note and an excellent length. Very good indeed and not too far off the complexity of a German Grosses Gewächs. This Seneca Lake winery was founded in 1998 by David Whiting and his wife Debra, a nationally acclaimed and award winning chef who tragically died in a car accident in 2011. Such is his passion for their shared dream that David continues to run Red Newt and he has just donned his chef’s whites to take charge of the estate’s culinary programme. He is more than capably assisted by his Harvard graduate winemaker, Kelby Russell. Slightly riper on the nose than the above wine, with a hint of green apple mingling with the lime character. A touch of residual sugar (13g/l) gave the palate a rounder feel, but it was balanced by plenty of fresh acidity and it finished dry. Lighter bodied than the Tierce, displaying more of the apple fruit that the nose suggested. Not quite the length and precision of the greatest Rieslings, but a very enjoyable drink nonetheless. Although Fox Run and its fifty acres of vineyards sit on Torrey Ridge on the western shore of Seneca Lake, it also produces wines from other exceptional sites around the lake. On the eastern side of the lake, the Doyle Family Vineyard is one such plot and it boasts some of the oldest plantings of Chardonnay in New York State. Sweet white stone fruit notes, pithy lemon fruit and a lactic, faintly cheesy edge to the nose. Dry yet soft and ripe thanks to the Traminette and to a hint of residual sugar; with a subtle creaminess from six months of lees contact. Gently smokey, lemon and grapefruit pith citrus fruit, notes of pear and sweet baking spices and a refreshing acidity. A very pretty and appealing wine, in a highly approachable style. This 35 acre vineyard on the western shore of Seneca Lake specialises in limited production wines from Riesling, Chardonnay and Pinot Noir and is experimenting with the viability of less well known, cooler climate, European red grape varieties such as Teroldego, Lagrein, Dornfelder and Blaufränkisch. These could well have the potential to produce high quality red wines in the cool Finger Lakes region where ripeness can often be an issue. Sustainability and environmental awareness are at the heart of Red Tail Ridge’s operations, from the green design of the winery that minimises its carbon footprint to carefully thought out viticultural practices that reduce the need for chemical treatments and increase the vineyards’ health. These include the use of biopesticides, biological control agents and integrated pest management systems to control pests and diseases; allelopathic cover crops to inhibit weed growth and to replenish the soil’s nutrients; and, thanks to vines being planted in laser-plotted straight lines, mechanised weed cutters can be employed to eliminate herbicide use and minimise soil compaction. Economic sustainability is also important to Red Tail Ridge as the health and wellbeing of the local community can only help their business to thrive. The estate’s main community outreach project is the donation of ten percent of the gross profit from sales of Good Karma to Foodlink in Rochester, New York. Foodlink uses the funds to supply food to food banks and is also involved with teaching children about nutrition in local schools. In 2012, this became a national project with funds being distributed within the state that the bottles are sold. Made by owners Mike Schnelle and his wife Nancy Irelan, the former Vice President of Viticulture and Oenology Research and Development for Gallo, it's no surprise that this wine was a real crowd pleaser. An unusual blend of Riesling and Chardonnay with 28g/l of residual sugar, this ticked a lot of boxes for many people. Smokey and toasty, with ripe bruised apple fruit on the nose. The palate boasted a very firm acidity to balance its medium sweetness. The lime, apple and peach fruit had a smokey and pithy edge to it. Rather than adding too much of its own character, the Chardonnay served to soften the intensity of the Riesling's lime fruit. Lovely and far too easy to drink, this would be ideal with all manner of spicy foods. Situated on the eastern shore of Seneca Lake and named after a local steamboat landing, this estate has been growing grapes since the fifties although it was not until the 1990s that it began to make wine. Lamoreaux Landing now controls over 100 acres of vineyards separated into over twenty different vineyard blocks. Earthy, leafy blackcurrant aromas with white pepper spice and a stoney minerality. Dry and perfumed on the palate, with nicely judged sweet American oak notes balanced by firm acidity and dark blackcurrant fruit. The long finish was a little oaky at this stage, but that should mellow in time. Attractive now, but will keep. Paumanok, the native American name for Long Island, was founded at the western end of the island’s north fork in 1983 by Ursula and Charles Massoud. Their eldest son, Kareem, is now the winemaker on this 103 acre estate and he is a hardline exponent of screwcaps, arguing passionately in favour of the winery’s decision to invest in a Stelvin bottling line back in 2008. Almost all of Paumanok’s wines are now sealed with screwcaps; only a small percentage of its top tier of wines is sealed with cork to give customers a choice. So good was the 2007 vintage on Long Island and Paumanok’s often difficult to ripen Cabernet Sauvignon was of such high quality that it was bottled as separate cuvée. As a result, the 2007 Assemblage ended up being a right bank Bordeaux style blend instead of its usual left bank style which would have seen Cabernet Sauvignon sharing star billing with Merlot. The blend was matured for 14 months in French oak, half of which was new. Gently leafy, earthy and tobacco scented, with sweet oak spice and ripe Merlot fruit on the nose. The dry, rather full bodied palate displayed dark bramble fruit and creamy, rich oak and reasonably high balancing acidity. Complex, long and very competently made but for my taste it just lacked a little excitement, although I'm probably being hypercritical. Certainly not a disappointing wine for the money. Hamburg-born entrepreneur Christian Wölffer was most at home at his Eastern Long Island estate in the Hamptons. In 1978, he purchased a 14-acre parcel consisting of an old farmhouse surrounded by potato fields and, by 1987, he had founded his vineyard on adjacent land. Today, what was originally a weekend getaway spans 175 acres and includes the acclaimed 55 acre Wölffer Estate Vineyard and the very highly regarded 100 acre Wölffer Estate Stables. Experiencing conditions very similar to those found in Bordeaux, Wölffer Estate’s loam soil and the maritime breezes from the nearby Atlantic are perfect for providing a balance of ripeness and acidity and result in an elegant, European influenced style of wine. Many passes through the vineyards were required to hand pick individual grapes over a six week period from September to November in order to catch them at the point of optimum ripeness and before botrytis or mould set in. The grapes were stored at 11°F (approximately -12°C) until the harvest was completed before being pressed whilst frozen to obtain a concentrated and very sweet juice. Mimicking the process of making a natural eiswein or icewine where the grapes are left on the vine until wintertime and are only harvested when ambient temperatures drop below -7°C, this method of cryoextraction removes a substantial element of risk from the equation. It also allows winemakers to produce a style of wine that their local climates would not otherwise permit them to make. Rich, honeyed, dried pineapple fruit on the nose with a touch of volatility from the huge acidity. Equally rich and intense on the palate; concentrated, luscious and sweet (211g/l of residual sugar) honey and pure, bright tropical fruit flavours were balanced by very substantial acidity. Long and very fresh for such a weighty, sweet wine, and not at all cloying. Lively and youthful, this has a long life ahead of it. These are all handcrafted wines from what are essentially boutique wineries. As a result, quantities are tiny and prices are on the high side, but don't let either of these factors dissuade you from seeking out these wines and trying them. They are well worth it. All maps courtesy of the The World Atlas Of Wine by Hugh Johnson and Jancis Robinson.